I was planning on doing an Install pfSense 2.4.4 from USB with a Serial Cable guide for a long while, but haven’t had the time to do it or didn’t have a spare appliance laying around. 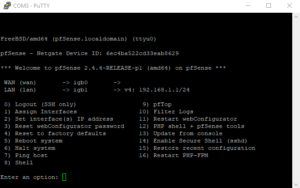 Now I got a brand new appliance and I can show you how to install pfSense 2.4.4 from USB from scratch! 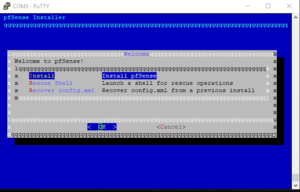 If I think back to the first time I have installed pfSense myself, I remember that it can be quite frightening, so that’s why I’ll show you each and every step, leaving nothing out. 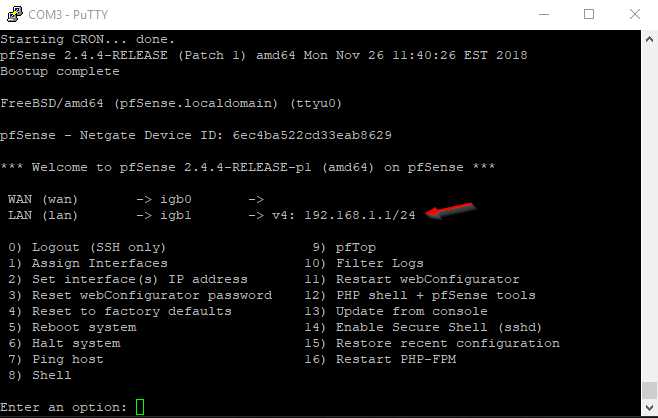 I will show you how to install pfSense 2.4.4 from USB using a Serial Connection. 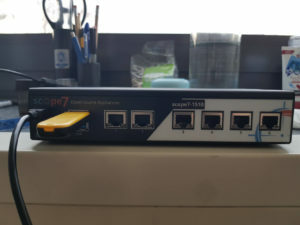 As I said above, I use a Serial Connection to connect to my pfSense Firewall. 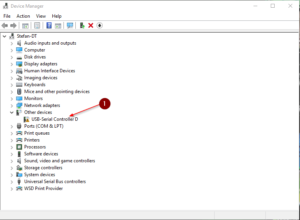 Be aware that if you have a VGA output on your pfSense and you use a Monitor to install it, you have to choose VGA on the console tab! For everyone also using a Serial Connection, download the following image from here. Make sure you choose everything exactly the same as I. Except the mirror, of course. After you have downloaded the image, navigate to your Downloads folder, right-click the file and use 7-zip to extract it. To be able to install pfSense 2.4.4 from USB, we need to create a bootable USB drive. A 2GB USB Drive is sufficient, even 1GB might do, if you happen to have this ancient technology. 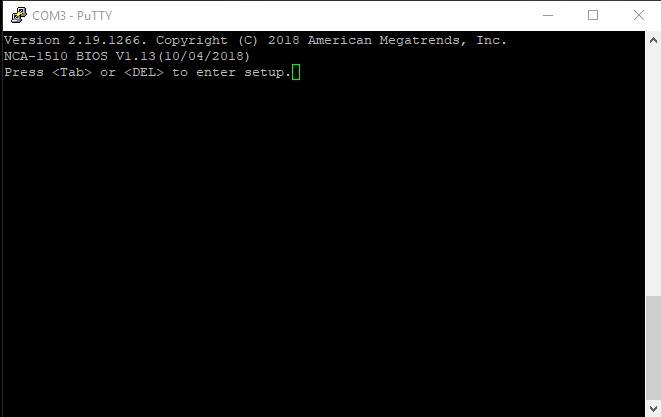 Start Win32DiskImager. 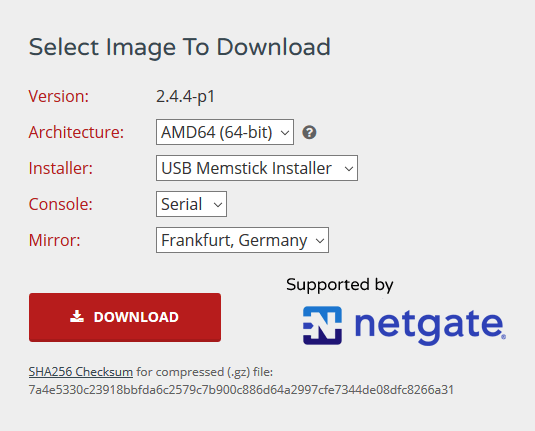 Make sure to have your USB Drive selected under Device, then choose the extracted pfSense.IMG file from your Downloads folder. Finally, hit Write. Be aware that everything on your USB drive will be deleted. Now, I have a built-in serial converter in my appliance, so I can use a USB Cable to connect my PC to my pfSense firewall. You most likely will only have a serial cable. Whatever you have, connect pfSense to your PC now with whatever type of serial cable you have. Also, go ahead and plug the USB drive into the USB slot of your pfSense appliance. Make sure your pfSense appliance is running now. Next, hit the Windows Key and type “Device Manager” into the search field. Open the Device Manager. Because I have this converter built into my firewall, I have to install a driver for it. If you use any kind of USB to Serial cable with a built-in converter, you probably also have to install a driver. Gladly, it’s very simple. 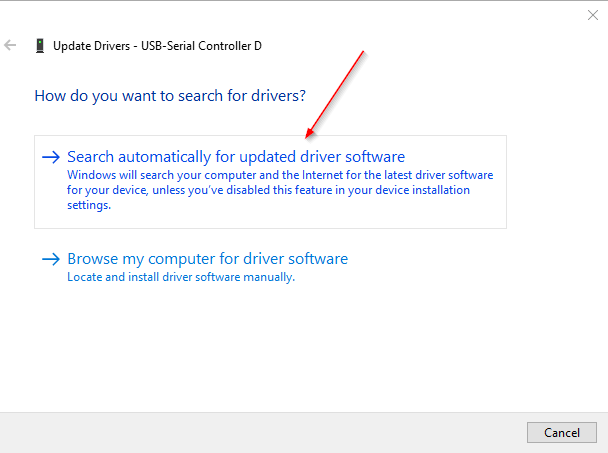 Right-click the USB-Serial Controller in your Device Manager and select Update Driver. Now for my converter that works. It finds the driver and installs it. 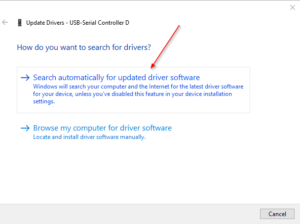 Your experience may vary, look up which type of USB to Serial Converter is built in your cable and search for that specific driver if Windows Update doesn’t find it. I have made very good experiences with the “Prolific USB-to-Serial” type converters. 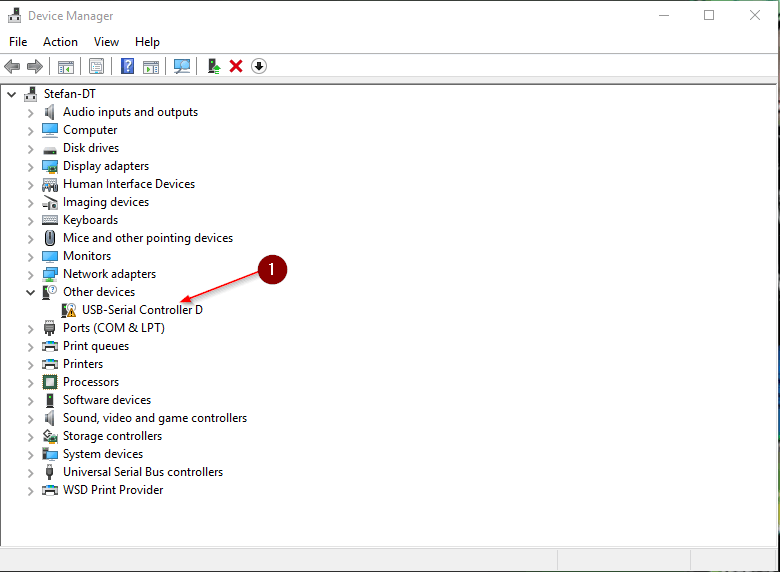 You will find the installed device under Ports (COM & LPT) now. Now, this is very important. You have to note the COM Port that your device got assigned. In my case, it’s COM3 as you can see in the screenshot. 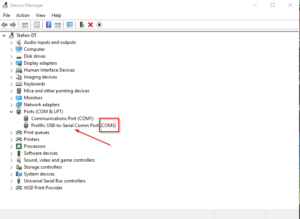 If you use any other Serial Connection, make sure that you know which COM port it is using. That is important for the connection with puTTY. 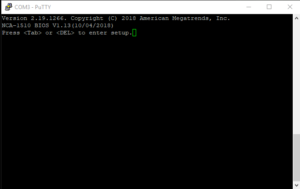 If you don’t know, simply go through all of your COM ports when trying to connect with puTTY, one will be working. Good, now that we got that figured out we can try to connect with puTTY. Open PuTTY. Don’t get thrown off by how many options there are. I’ll got you. Set the Connection Type to Serial. 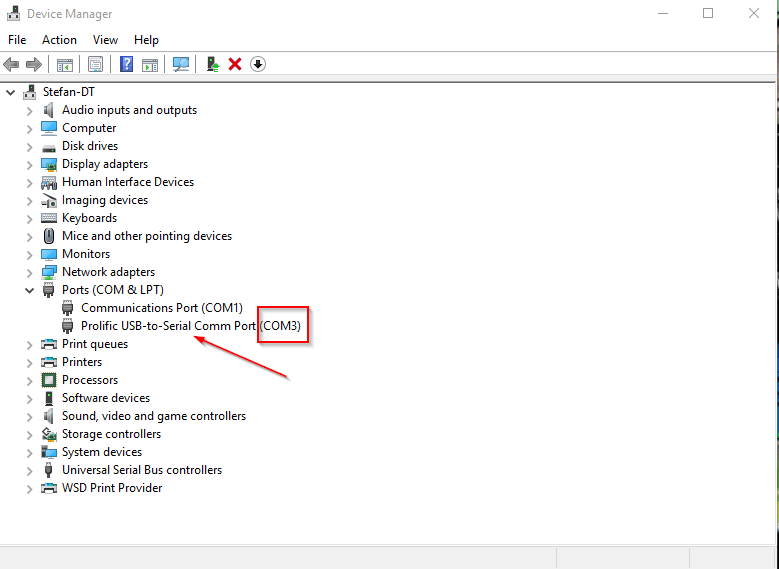 For Serial Line, enter your COM port. For Speed, choose 115200. The speed might vary depending on your appliance. In case, look up your appliance documentation. The default values for be pfSense can be found here. Now type “pfSense” underneath of “Saved Sessions” and hit the Save button on the right. This way, you can reconnect to your pfSense firewall without typing everything again each time you want to connect. Finally, click on Open. Hit the Enter key once in the Window. You should now see something. I already got pfSense installed, that’s why I see the pfSense menu. Your experience will be probably different, nevermind about it. First, we need to make sure to be able to boot via USB drive. 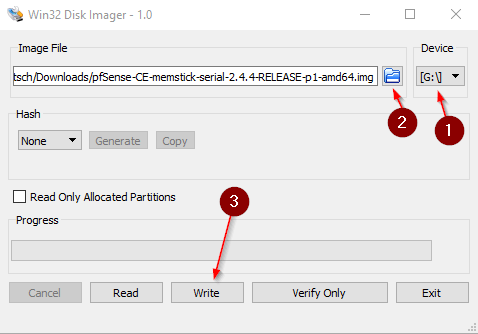 Because you already placed your USB drive in your firewall, it’s possible that you are already in the pfSense installer menu. If that’s the case, you can skip the following BIOS step and wait until we get to the installation. Restart your firewall and get into the BIOS. This probably varies from appliance to appliance. I have to press either TAB or DEL when it’s booting up. Look up your appliance’s documentation in case you can’t figure it out. Usually, it’s written there which button to press when you start it. Leave your puTTY window open, restart the appliance either by pressing a button or just pulling the power cable. 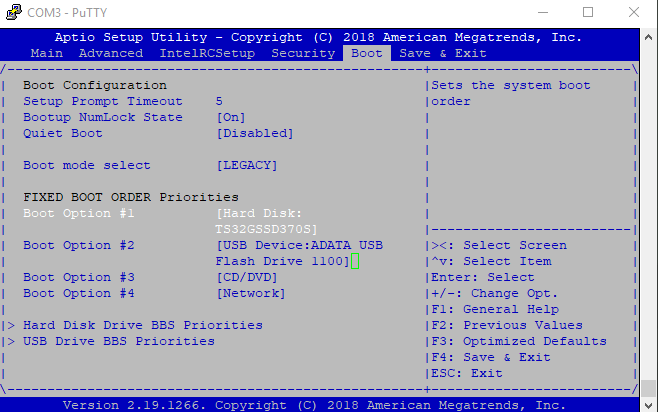 Once you are in the BIOS, navigate to Boot. 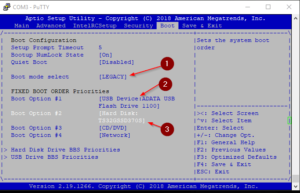 Make sure Boot mode is on LEGACY. 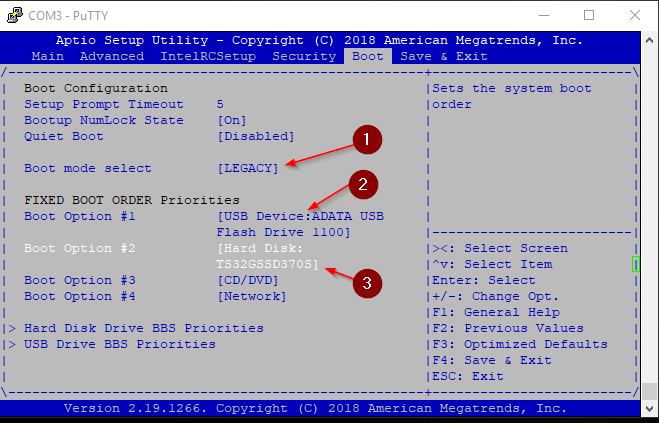 Make sure your USB Drive is on #1 as a Boot Option and your Hard Drive is on #2. Navigate to Save & Exit and select Save Changes and Reset. Your firewall will reboot again. Now, if you did everything correctly, your appliance should boot from the USB drive. I will run you through the whole installation process now. For Console Type, type xterm and hit enter. Choose your preferred keymap by scrolling down, selecting the one you want and pressing enter. Select “Continue with YourKeymap“ on the top and hit enter. Repeat the same in the next step. For partitioning, that’s up to your personal preference, but I will choose the new Auto (ZFS) Filesystem that was introduced with pfSense 2.4. 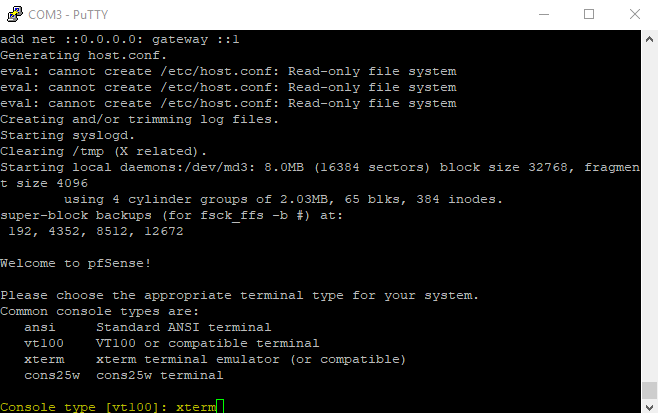 If you don’t know what to choose, I recommend ZFS for you as well. Select Pool Type/Disks and hit Enter. Choose Stripe – No Redundancy. Make sure you select your appliance’s hard drive in the next window by pressing Space Bar and hitting Enter. 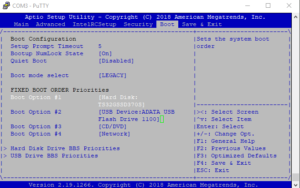 Make sure Partition Scheme is set to GPT (BIOS) and leave everything else as default. Finally, select Install on top of the screen and hit enter. Agree and be aware that everything on your Hard Drive will get wiped. For the question, if you want to do some manual configuration steps, choose no. Now select Reboot and get ready to enter that BIOS Menu again while the appliance is rebooting. We need to change the boot order back to the correct order. Remove your USB drive from the appliance after it rebooted. Navigate to Save & Exit and select Save Changes and Reset. 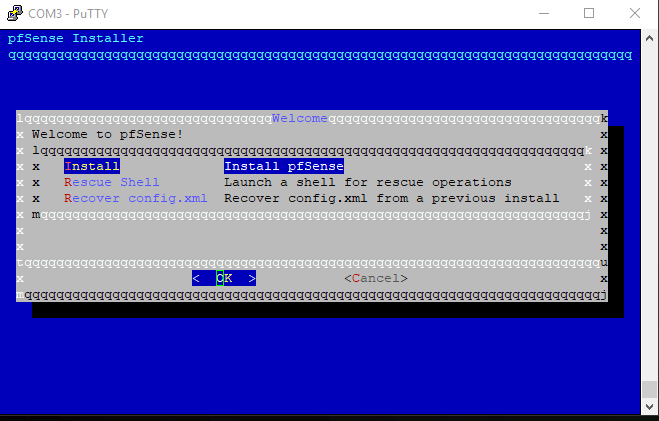 If all went well, you will now end up in the pfSense Welcome Screen. You can see that the interfaces were automatically assigned. Your first Interface got assigned as WAN and your second interface got assigned as LAN. DHCP is enabled per default and your pfSense firewall has the IP of 192.168.1.1. Go ahead and connect a LAN cable to the second interfaces, or, the LAN interface. Connect your Laptop / PC / Switch to the other end. The WAN interface is the one where you want to plug your Modem / Internet Connection in. If you don’t know which modem to use, I highly recommend the DrayTek Vigor 130. 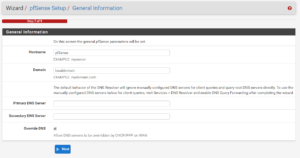 Heres a guide on how to configure a DrayTek Modem for the use with pfSense. I run multiple of those and they served me very well over the years. Open a Web Browser and enter the IP of your pfSense 192.168.1.1. If you want to get rid of that warning message, I got you covered. Click Next on the first dialogue. 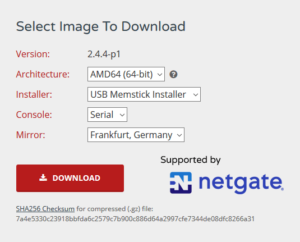 Click Next on the Netgate Global Support dialogue. Choose a Hostname and a Domain, if you don’t have a Domain leave it as localdomain. Click Next. Choose your Timezone, leave the Time server hostname as default. Click Next. Now, to configure your WAN Interface it depends on how you connect to the internet. Here in Europe, we mostly use PPPoE and we need to enter the credentials provided by our ISP. 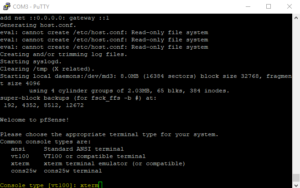 If you already have a working internet connection and just want to connect pfSense to that, use DHCP. Look up your Internet Provider’s information, or ask in the Netgate forums. If you choose PPPoE, scroll down until you find PPPoE configuration and enter the details provided by your ISP. Everything else stays on default, scroll to the bottom and click on Next. You can either change the LAN IP Address or leave it on default. If you don’t know what that means, just leave it as it is. Change the default admin password and choose a safe password. Congratulations! If you made it this far, you successfully installed pfSense 2.4.4 via USB / Serial Cable! Amazing! As the last step, let’s set up the temperature sensor to display the correct values. 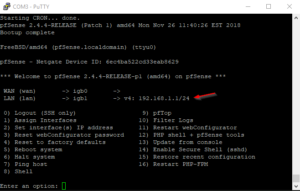 In the pfSense Web GUI navigate to System / Advanced / Miscellaneous. Scroll down until you find Cryptographic & Thermal Hardware. For Thermal Sensor, choose either Intel or AMD, depending on which processor type you have. Scroll down all the way to the bottom and hit Save. Now your Thermal Sensor should display the correct value. And finally, as promised, to repair your USB Drive after the installation follow this article. 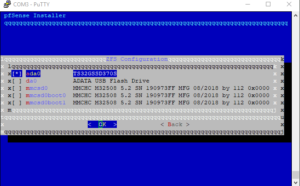 Your USB drive will now have multiple partitions, rendering it unusable. We use Rufus to fix that. 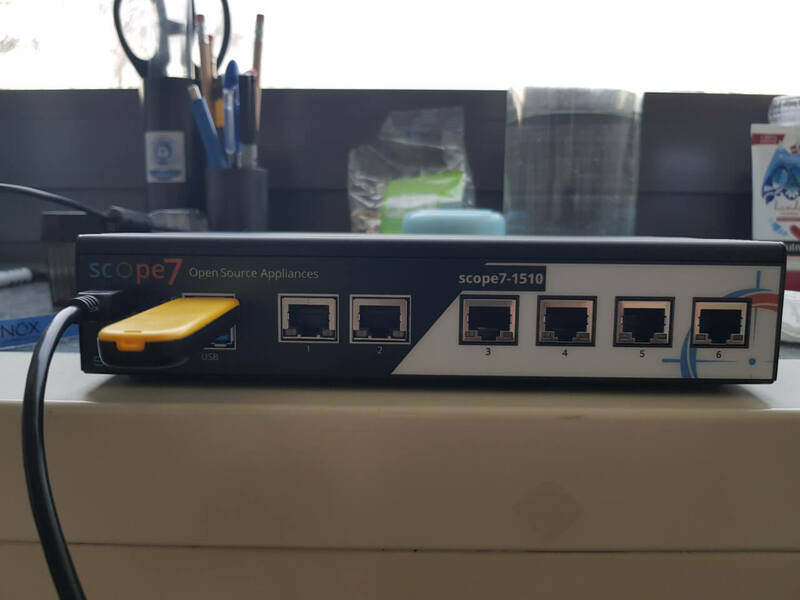 It can be a struggle to install something like pfSense via Serial Cable if you do it for the first time, that’s why I thought it might be a good idea to go through each and every step in detail. I hope you were able to install it and establish an internet connection. 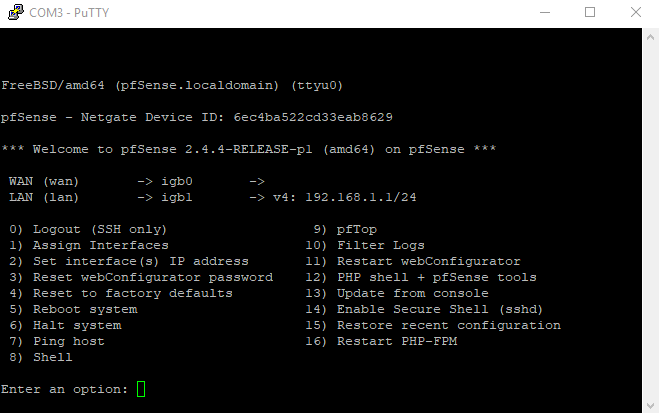 pfSense is a fantastic open source firewall that teaches you a ton of things when you use it in your home network. 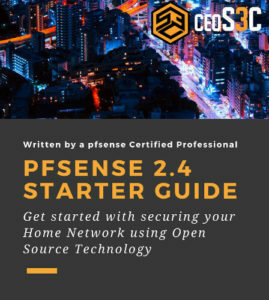 If you appreciate this article, make sure to check out my pfSense Starter Guide as well, you can use it as a reference guide. Also, check out my YouTube channel, there are tons of videos on pfSense. Just to name a few to get you started.